2) Round off two top corners of each board. Make sure they are cut the same. 3) Cut strips of foam board 4” wide. You will need enough to completely border the tombstone sides and top. The bottom will be open. 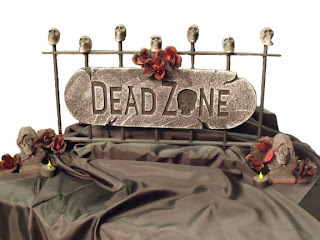 4) Before assembling, take each piece of your tombstone and run it along the edge of a countertop or table. This will put creases or wrinkles in it which will give it a better look. 5) Glue the strips along the edge of your first tombstone piece. Then glue the back of the tombstone to the other edge of the strips. 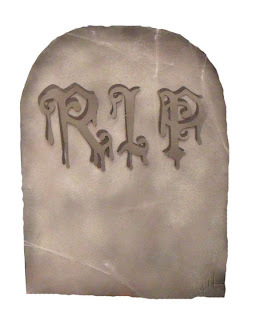 Now your tombstone is ready to be painted. 6) Cover your surface with newspaper and spray the front and the sides with the adhesive. Do small areas at a time. Once you have an area sprayed with adhesive, sprinkle with sand and let dry. The sand gives a grainy/stone look and feel. 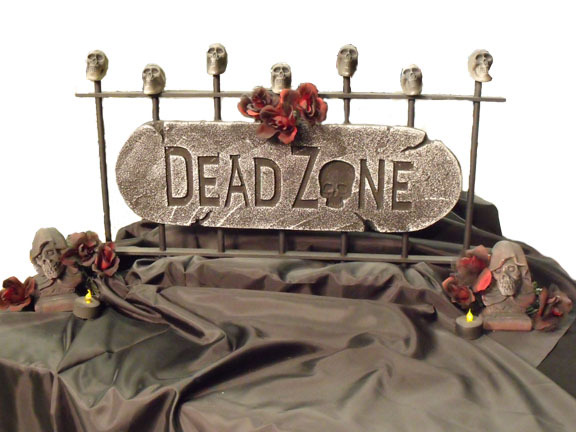 7) Spray entire tombstone surface with gray paint to camouflage the sand and blend it in with the foam board. Let dry. Accent with a little black spray paint around the outer edges. Also, a few splatters of black will add some additional accent on the front and sides. 8) Cut the letters R,I & P out of the black and gray cardstock. Layer them on the front of the tombstone...gray on top of the black. Offset the letters so that you can see both colors. 1) Cut three pieces of foam board. Cut one piece 11”X19”. Cut the other one 10”X18”. 2) This next step will be performed on your 11”X19” piece. To create your “coffin” lid shape, measure down from the top 3” on either side and mark. Measure in from each top side 2”. Draw a line connecting the two marks and cut away these pieces. Now you have the top look of your coffin. Measure 8” down from the top, on each side and make a mark. Measure in 2 ¾” on either side at the bottom. Connect the 8” mark and the 2 ¾” mark and cut away these areas. 3) Take your two smaller (coffin bottom and coffin lid accent) pieces and do the exact same thing that you did above…same measurements, same cut aways, etc. 4) Once you have your coffin shape pieces cut out, take one of your smaller pieces and carefully measure each angle along the entire outer edge. For each angle, you will need to cut a piece of foam board for each side piece that is the length of the angle and 4” tall. 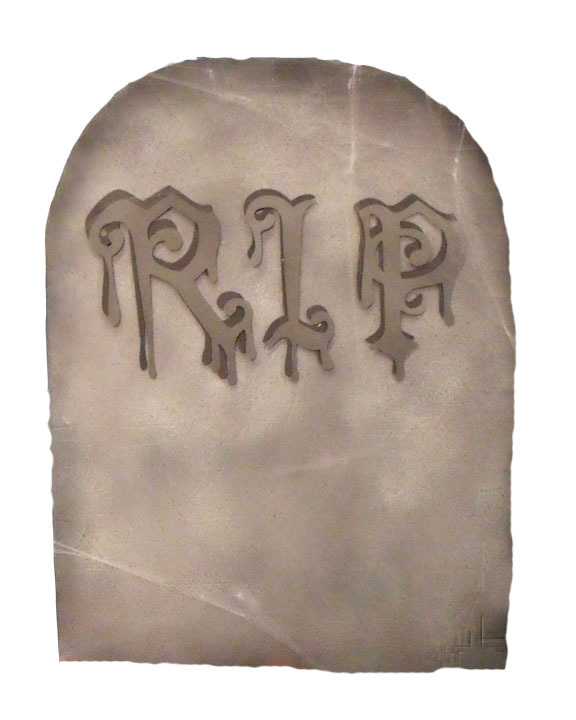 For example, if the bottom straight edge of your coffin is 4 ¾”, you will cut a piece of foam board 4 ¾” X 4”. Once you have all of your foam pieces cut, begin to glue them all along the outer edge of your coffin bottom shape. Be sure and glue the side pieces all together as you go to completely enclose your coffin. Set aside. 5) Take your other smaller piece of foam board and glue onto the larger piece. This is your coffin top. 6) You can glue the top to the coffin base or you can leave it loose. 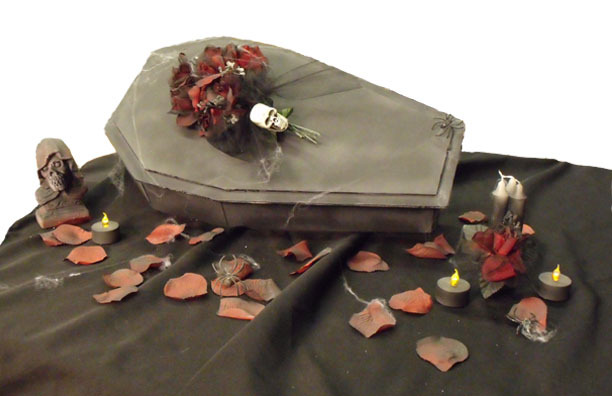 7) Spray paint the coffin black. Although it is already black, you need to paint the white edges that are showing. 8) Give all of your red roses and red petals a light spraying of black paint. Petals can be scattered around for accent. 10) Glue a mini skeleton head to the black tulle bow. 1) Take both of your wood strips and measure in 1 ¾” and make a mark. Then make a mark every 3.5” after that. You will have 7 marks. Do this on both of the wood strips. 2) Drill holes in every mark, in both wood strips. 3) In one of the wood strips, place a dowel in each hole. Alternate dowels, starting with the longest, then a shorter, then a longer, etc. Use the mallet to tap them down into their holes. Each dowel should be through the wood strip approx 1”. 4) Next fit the other wood strip to the top of end of the dowels. Make sure that the wood strip is level and even all the way down the line. Dowels need to stick up 1”-2” above the wood strip. 6) While paint is drying, drill a hole into the bottom of each skeleton head. Lightly spray with a bit of black spray paint. Let dry. 7) Place a skeleton head on each fence post. The shorter dowels will have the skeleton head resting on the top fence piece. The longer dowels will support the skeleton head about 1” above the top of the fence. Make sure to glue the heads in place. 8) Drape fabric over the floral foam and press bottom of fence into the floral foam to steady your fence and assist with it’s standing. This method is used if you are going to display it on a table top. If you are using it for your yard, you can press it right into the ground. 9) Hook Halloween plaque/sign over the middle dowel to hang from the fence. 11) Spray paint the bases of your tea lights. 12) Attach 3 roses to each side of the fence. Add a tea light in the middle of the roses.